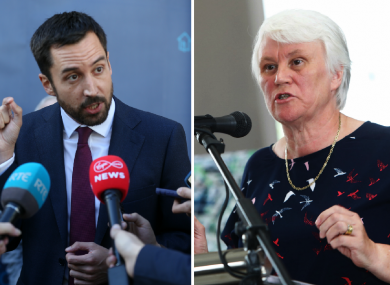 MINISTER FOR HOUSING Eoghan Murphy says he made “no deal” with his colleague Catherine Byrne to persuade her to vote against a motion of no confidence in him. Murphy survived Sinn Féin’s motion by 59 to 49 votes last night, following days of speculation as to which way his party colleague would vote. Reports circulated yesterday that junior Minister Byrne would abstain from voting for or against the motion over a housing development in her constituency, which she had previously raised objections to. However, despite reported meetings taking place between the two ministers, as well as between Byrne and the Taoiseach, Murphy claimed that no deal was needed to influence how Byrne would vote. “Catherine saw that this was a Sinn Féin stunt that wasn’t going to do anything for anyone in her constituency, and so she didn’t support it,” the Minister said at the launch of the national Housing First strategy in Dublin this morning. The Minister also confirmed that the redevelopment of St Michael’s Estate, over which Byrne had raised objections, will go ahead as planned. Under the plans, 470 new homes will be built on the site in Inchicore as part of Ireland’s first ever ‘cost rental’ housing scheme. Concerns over the plan have been raised by locals since it was announced in July, with some saying more community services are needed before hundreds of new homes can be built in the area. Addressing those concerns, the Minister admitted that it was a challenge to develop or redevelop local communities to protect those who already lived there, but said homes needed to be built to resolve the housing crisis. “We have to move forward in building thousands and thousands of homes,” he said. He added that Byrne continued to have objections to the plans for St Michael’s Estate as they stand, but said she was “free to air” concerns to him as a local representative for the area so long as they didn’t clash with her ministerial duties. Email “'She saw it as a stunt': Eoghan Murphy says Catherine Byrne got 'no deal' for confidence vote”. Feedback on “'She saw it as a stunt': Eoghan Murphy says Catherine Byrne got 'no deal' for confidence vote”.